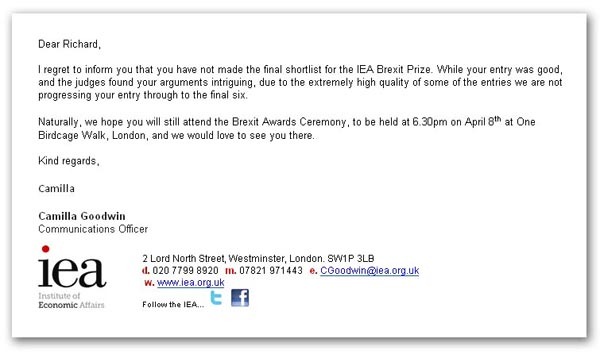 It is almost four years to the day that we received a perfunctory note from the IEA informing us that our submission for their "Brexit Prize" had not even made the final shortlist – in common with every other submission that had suggested adoption of the so-called "Norway option". The disgusting Lord Lawson and his biased panel of judges had rigged the competition so that no such heresy made the final cut. But days later, I was able to publish the first version of Flexcit, the 98 pages which has since expanded to its current 406 pages, augmented by 17 Monographs and not far short of two million words written on this blog. No one with any honesty can say that Flexcit didn't make a mark. After having read it, and met me several times, Dominic Cummings - of what was to become Vote Leave - know all about it,but deliberately rejected it. His were the spurious grounds that a coherent plan for leaving the EU would be "divisive" to the Tories who were to hijack the campaign. In the event of a leave vote, the great Cummings idea was "to force a new Government to negotiate a new deal and give us a new vote". How did that work out Dominic? As to Leave.eu, I met Arron Banks several times in his offices in Bristol and personally handed him a copy of Flexcit. We even did a special version for him, called the "The Market Solution". But, after showing initial enthusiasm, he took fright after Ukip extremists gave him a hard time. He then dumped the plan without even the good grace to tell me. That is the measure of the man. Nevertheless, we ran our own Leave Alliance campaign, with Flexcit at its centre. And, with an online copy freely available, we registered more than 100,000 downloads. The media knew all about it, but it was quite deliberately ignored. It didn't fit the narrative. But those four years down the line, I suppose we must be expected to hold our hands up in awe as the great Simon Jenkins finally acknowledges the value of the "Norway option, believing it "offers the only sensible way for Britain". He also tells us that: "The smart money in Brussels was always on the Norway option". That is not to say that Jenkins fully understands its advantages – but he's closer than some. The so-called European Economic Area, he says, "was a simple 'off-the-shelf' basis for a bespoke deal with the UK". Of course, it acquires its prestige not from us lowly creatures who have nurtured it for so long. Jenkins relies on "a favourable analysis" last month in The Economist. Even though superficial and error-strewn (it claims, for instance that Iceland has never invoked Art 112 of the EEA Agreement), it obviously impressed Jenkins enough for him to give it a punt, especially when the august journal declares that, given all that has passed: "It seems perverse now to reject the option out of hand". Jenkins now sees the barrier to forging a new relationship with Efta, lying: "not in negotiating it but in overcoming Theresa May's belief that her fate depended on some 50 backbench leavers and the editors of the Sun and the Daily Mail. She was terrified of them". This is typical bubble-talk, though, seeing things through the spectrum of Westminster politics, again at a wholly superficial level. In fact, the poison long predates Mrs May, stemming from when David Cameron and Vote Leave saw common cause in trashing what they insisted on calling the "Norway model". With the media never bothering to get past the low-grade "pay-no say" propaganda of both sides, or the added canards that the option meant buying into unrestricted freedom of movement and staying subordinate to the ECJ, the "Norway option" has never stood much of a chance. Now, however, we are perhaps beginning to see a crack in the dam. Underlying Jenkins's Damascene conversion is the same conclusion to which we are drawn: that the UK is simply running out of options. This makes Efta/EEA the obvious escape route. Unlike Jenkins, though, who thinks that Mrs May will "drive her hard Brexiters into sullen acceptance [of the Single Market] or resignation, my reading is that the prime minister will never back down on her Lancaster House stance. Rather than the Jenkins's thesis that the unacceptability of the "vassal state" transition will give Mrs May the opening she needs to pursue the Norway option, it is more likely that she will try to force the transition settlement through the House, regardless of the opposition. Like the Financial Times, I tend to the view that Mrs May will abandon her current "red lines" and accept any deal she can get. In this, she can always rely on her back benchers. Confronting electoral oblivion, they will cave in and back their leader – just as they did in the final Maastricht vote. Thus, I don't see a sudden change of heart coming from No. 10 – any more than I see the media suddenly recognising our role in the debate, and the fact that we have done more than most to keep the Efta/EEA option alive. But that, as we have so often observed, is the way the media works. Nothing exists until they have discovered it or "invented" it for themselves. And such is the fear of independent political blogs, and especially serious and well-informed blogs such as this one, that they will go to any lengths to avoid drawing attention to them, or acknowledging their work – even if they draw heavily on our material when it suits them. A classic example of this parasitic relationship comes with Ian Dunt of politics.co.uk who has made a career of lifting other people's ideas from blogs, twitter and other independent sources. Nonetheless, for all his assiduous "borrowing", he has only just noticed that "Free market extremists" are hijacking the "Brexit trade chaos". Picking on the recent Policy Exchange report, he regales us with its dastardly plot, whereby it is "demanding Britain unilaterally reduce its tariffs as part of a potent new Britannia-rules-the-waves trading adventure". The intent is, says the egregious Dunt, "to use Brexit as a hard reset on British society, eradicating the protections available to struggling industries and unleashing a kind of Viagra-capitalism. It's basically Thatcherism 2.0". Never mind that unilateral tariff reduction is Minford's agenda and that we've been banging on about it for several years. Never mind the close relationship between the Policy Exchange and Legatum, and with the IEA. Dunt is obviously behind in his reading and is only just catching up. Soon enough, he will "discover" this and claim it for his own. Meanwhile, the rest of the media is indulging itself in the ongoing drama of the blue passports and the news that the printing contract could go to a Franco-Dutch company. Perhaps the most entertaining comment comes from the Evening Standard. "Surely", it observes, "this is exactly the kind of global free trade the Brexiteers told us they were all in favour of? Britain benefiting, as the free market delivers the most competitive product to our citizens". Rubbing salt in the wound, it goes on to say, "That's certainly what they once claimed. Jacob Rees-Mogg said 'free trade puts consumers first and lowers prices for all'. Yet he, and a host of other Brexiteers, now tell us that the new passport contract should have been awarded to a British firm - not because it offers a better product at a better price, but for the simple reason it is based in Britain". But, in their rush to point out the EU dimension, none of the media pointed out that, even after Brexit, we will still be signatories to the WTO Agreement on Government Procurement. Ironically, the likes of Rees-Mogg, so keen on WTO rules, would still – most likely - find his treasured passports printed abroad. Thus, even when they do their trivia, the media so often miss the point. But in this case, we hadn't done it on the blog for them to scavenge. No doubt, in fullness of time, the media will catch up once more, and discover the WTO link all by themselves. That is what they do.